The course of these sessions, starting right from the next one, will begin with the epic, after which we will next take as our focus an extremely vast literary craft, the drama. […]. We will try, in any case, to add something to the disassembling of the greatest works of various nations and centuries with our history of art. It is a property of the attribute of perfect beauty that it fascinates, arrests, captivates, and transports not only experts but the mass of people who are capable of seeing it. However, a cry of adoration is not sufficient; we must acquaint ourselves closely with these masters of art [i.e., criticism, literary studies – H.M.], which through close study, through disassembling and comparison, have tried to discover the unfailing rules and show what is the participation of a good writer and good connoisseur together. So what meanings, in relation to the study of literature, were ascribed to the word “rozbiór” at the beginning of the nineteenth century? An attempt to answer this question shall enable us to trace some strikingly varied approaches to work with the literary text in the late Enlightenment. For it is not easy to reach, in great works, that mystery of arrangement, these if I may, forms of scaffolding and springs, on which the construction stands. Doing so cannot result from a passing reading; only concerted effort at study will lead us to knowledge of art, and the time of exertion will be rewarded by untold bliss. -word, an approach the theoreticians of classicism have sometimes been accused of. Osiński’s analysis, at least in its declared intent, thus resembles a demolition that allows the structure of a building to become known. Osiński also calls the work of literary scholars an “exact” and “concerted” form of study, opposing it to a “shout of adoration” or a “passing reading” (a typical attitude, we may surmise, among the Romantics, with whom the professor polemicizes). The work of the literary scholar here approaches, if not science, then at least professionalization. The word “exact” used by Osiński, is not used here in the sense we now associate with the exact sciences, but rather means “precise,” “meticulous.” Still, the opposition in question directs our attention to yet another aspect of the meaning of the word “rozbiór” – it is also a mathematical concept (referring to mathematical or trigonometric analysis, as Linde notes), as well as a chemical one (meaning decomposition, superseded later by “rozkład”) and an anatomical one (according to the Wilno dictionary: “division of an organic body into parts to learn the internal structure, changes taking place in the organism, etc. dissection”). Thus we find that the “rozbiór” of a literary work in the Polish of that day bears traces of resemblance to investigative procedures used in those sciences. The use of dissection or analysis as a method of study appears in another text from the same period – “Rozbiory pisarzów” (Analyses of Writers) by Euzebiusz Słowacki – of which Eugeniusz Czaplejewicz has noted: “Analysis [Rozbiór] is thus a point of departure for scholarly inquiry. Scholarship takes its beginning from analysis.” Czaplejewicz relies, in this assertion, on a remark imputed to Słowacki, according to which (in Czaplejewicz’s paraphrase) “scholarship deals primarily with analysis, then description, and finally, inquiry into causes.” With regard to “Rozbiory pisarzów,” those remarks must be handled with caution. These short fragments, like the analyses offered by Osiński, are devoted to individual works. They are often very short, however, containing only an encapsulation of the content and an evaluation of a particular work. It could be said that that is precisely how Słowacki carries out the procedure of analysis, but it should be remembered that the title of this section of his Collected Works was probably not devised by the author. He himself only uses the term “rozbiór” in three cases, which we must in connection with this question examine more closely. In the fragment entitled “Reja Spólne narzekanie korony” (Rej’s “Common Complaint of the Crown”) Euzebiusz Słowacki writes: “we, wishing to make our reader’s picture of this author’s talents and way of writing more exact, will enter here into a somewhat longer analysis of one of Rej’s writings entitled Spólne narzekanie wszej korony […].” The same adjective, “przydługi” (lengthy), appears with the word “rozbiór” in the chapter on Sebastian Klonowic’s Flis: “Taking in view the sparseness of this writing, let us enter here into a lengthier analysis of it.” Both of the passages mentioned maintain the summarizing approach of those lectures. In comparison to his other lectures, they contain a much greater abundance of quotations from the works being discussed, and in particular, a much greater number footnote citations. The remarks contained therein relate primarily to the linguistic layer of the text – its rhetorical structure: “In the first two periods there is a palpable neglect in the uniformity of their endings”; archaisms: “Rej uses the endings ‘-och’ and ‘-ech for all seven cases, uses the ending ‘y’ with feminine adjectives in plural, for example ty cnoty, feminine names in the second case he sometimes ends with ‘ei’ or ‘ey,’ e.g. wiarei, pracey”; and style: “This repetition of one pronoun unnecessarily […], and use of the conjunction a to connect thoughts makes his speech diffuse. It appears that this is an imitation of holy books.” Słowacki also takes care to explain words that may be incomprehensible to his contemporaries: “Biesagi [scrips] are a kind of sakwas [travelling-bags] that were hung on horses,” “the word xieniec refers to fish innards,” “osobne is the same as osobliwe [individual], beautiful.” In these explanations, he does not shy from evaluating individual expressions: “Smaży się majętność [the estate is being scorched] is an improper expression, and even in those times, poor usage […]. One should say gore majętność [the estate is on fire]”; “This comparison with Cain and Abel is completely inappropriate. It is a defective age in which it was necessary to cite the Scriptures under fear of seeming uneducated.” As should be evident, however, this evaluation is marked by a consciousness of cultural differences and changes in language. Similar assessments of the composition of an entire text can, however, be found in the main text: “taken as a whole, the [work] in question sins against brevity,” “more such fairytale or historical deviations […] would have made this work incomparably more pleasurable.” On the basis of comparing the chapters devoted to works by Rej and Klonowic with the other parts of “Rozbiory pisarzów,” we can thus assert that a “rozbiór,” or at any rate a “lengthier” (more extensive and exact) one was, for Słowacki, a kind of commentary on the text, relating primarily to its rhetorical structure, grammar and lexicon. A somewhat different understanding of the term is displayed in its last instance of use in Słowacki’s “Rozbiory.” It appears in the fragment placed at the end of the collection entitled “Dokładna nauka języka i stylu polskiego w dwóch częściach […] przez Tomasza Szumskiego […] w Poznaniu 1809” (An Exact Study of Polish Language and Style in Two Parts […] by Tomasz Szumski […] in Poznań 1809). Słowacki writes: “The work we are undertaking to deliberate on […] by many measures deserves attention; and its [rozbiór] will give us material for many observations which can be useful in the study of our native language.” The dissection that follows would nowadays undoubtedly be characterized and classified as a scholarly review. The critique of the work under discussion is expressed in such formulations as the following: “The introduction to grammar contains definitions and distinctions which do not always bear the mark of logical exactitude,” “in fairness, it should be mentioned that the author makes some apt remarks […], but when the author […],” etc. This understanding of the word “rozbiór” – as a review – was not taken note of by Linde, the closest lexicographer to Słowacki in time; it does, however, appear in later dictionaries. In the Wilno dictionary, it is the fourth definition: “report, critical deliberation, criticism, review. Rozbiór of a work of dramatic art”; in the Warsaw dictionary it appears as one element of the first meaning: “report, criticism, evaluation of a written work or a work of dramatic art.” Above all, however, an examination of print journalism in Słowacki’s time shows that already at the beginning of the nineteenth century that meaning was widely in use. Here is a handful of examples from the Dziennik Wileński (Wilno Daily): “Architecture by Sebastian Count Sierakowski. A critical analysis of the work by Jan Śniadecki” (vol.1. 1815, p. 90), “Samolub [Egoist], a comedy by J. U. Niemcewicz. Critical analysis by Leon Borowski” (vol. 2 1815, p. 82), “Nauka matematyki [The study of mathematics] by Alexander Konkowski. First volume encompassing arithmetic. A critical analysis of the work by Michał Poliński” (vol. 3, 1815, p. 83), “Analysis of a work entitled: O filozofii by Felix Jaroński, with remarks on it by X. Anioł Dowgird” (vol. 6, 1817, p. 67), “Joachim Lelewel’s bibliography in two volumes, a review of volume 1” (vol. 2, 1813, p. 121). Let us observe that in most cases “rozbiór” (translated in the examples as “analysis”) appears together with the adjective “critical,” in the context of which the word “rozbiór” seems (at least initially) to imply neutrality, while only the “critical” aspect signifies the designation, typical in a review, of the work’s faults and virtues. That is not an ironclad rule, however, as the two final examples, also involving reviews, will show. Among the examples cited of “analyses,” the attention of literary scholars is naturally seized by Leon Borowski’s text about a work by Niemcewicz. That review begins with remarks regarding the poet’s introduction to an edition of his comedy. It focuses on defining the genre he chose and the aims he set for himself as well as the aims implied by the genre – their complementarity is, after all, the measure of a work’s success. Two of Borowski’s footnotes are of interest here: the first is a comparative note citing other European works dealing with the topic of egoism, the second an editorial one, indicating errors in the typography of the comedies. The review itself is introduced with the sentence: “Here are some remarks on the arrangement of this comedy,” defining the main object of the reviewer’s attention. In fact, the review presents mainly an evaluation of the construction of the plot (or “arrangement”) with reference to the principle of probability (is it convincing that several main characters happen to be returning to Warsaw on the same day? ), most often as a kind of inner logic of events (does a character have an important reason to enter the room in a given scene? Does she or he have a valid reason for informing an interlocutor about the things they converse about?). There are also remarks concerning decorum, the suitability of a character’s social status to the content and style of her utterance (can a cook voice metaphysical assertions? ), the ethical obligations of art (“the spirit of seemliness of our age […] is outraged against such treatises […] which […] do not incur on the malefactor any mockery, humiliation, any punishment”), personalities (“each one, taken separately, is powerfully drawn and with great knowledge of the human heart”). The text concludes with commentaries on particular linguistic expressions, e.g. “‘that that nations never lose’ – one should say: ‘that which’”; “the word ‘bajuta’ cannot be found in Mr. Linde’s dictionary either, and Lithuanians do not know what it means […].” What links Borowski’s analysis-review to the texts referred to earlier is primarily the ordering of the argument – it proceeds scene-by-scene, commenting on the plot action summarized and selected quotations. These remarks are extremely comprehensive, which is why the detailed analysis deals only with the first act, and with regard to the later acts, the reviewer is content to address only his most major concerns. The techniques of enlivening speech that are peculiar to Krasicki include frequent repetitions of the same words at the beginning of several lines in an octave – such as here the word “wojna” [war] repeated in lines 1, 2, 5, and in the next stanza the words “w mieście” (in the city) in stanza 5 “szczęśliwszy” (happy) and in many other places. Rhetoricians call this figure repetitio. And as the beauties of Trembecki’s poetry are the result of his great talents, extensive and profound erudition, joined with a taste shaped precisely on the models of old Polish classics and ancient classics, so, in order to feel those beauties of feeling in their full intensity, it is necessary, in addition to being in the proper frame of mind, to know the old Polish language with some exactitude, and even ancient languages […], which is why an explication and commentary on all Trembecki’s writings would be very important and useful, leading to the possibility that Trembecki’s taste might become increasingly widespread. The published „Uwagi nad ‘Monachomachią’” also constituted a certain innovative accomplishment. 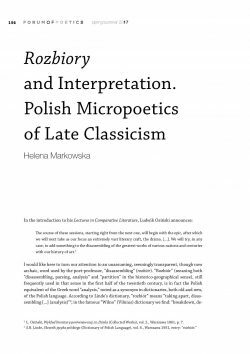 The innovation consisted in the fact that Borowski was the first to apply to a contemporary text methods developed in the study of classical philology. These methods were being taught at Wilno at that time by Borowksi’s and Mickiewicz’s teacher, Gotfryd Ernest Groddeck. Among the publications of antique works prepared by Groddeck that are still available, the one that can be treated as the model is his edition of Sophocles’s Trachiniae (Women of Trachis), which is preceded by a preface in Latin (Fabulae Trachiniarum nomen, argumentum, personae, tempus, ornatus scenicus), and accompanied by extensive explication in the form of end notes (Animadversiones ad Sophoclis Trachinias), explaining certain expressions and stylistic figures, providing factual explanations and references to other texts of antiquity. Neither the other Greek and Latin texts published by Groddeck, nor the editions prepared by Borowski (Terence’s Adelphi with a Polish summary of the play and Ovid’s Metamorphoses in Żebrowski’s translation, preceded by “O Jakubie Żebrowskim i jego przekładaniu” [On Jakub Żebrowski and His Translation]), though accompanied by prefaces and uncontestably carefully prepared, possess such an elaborate critical apparatus. The effort undertaken by Borowski on the material of Monachomachia is thus all the more striking. Here we must pause for a moment to consider the choice of material in that volume. In Borowski’s case, as with the later commentaries by Mickiewicz, he was dealing with writers of the Polish Enlightenment at its high point, under Stanisław August Poniatowski. Though in the case of Mickiewicz’s text, scholars often speak of the cult of Tremebcki said to have been reigning in Wilno, we should expand our view here and turn our attention to the fact that the beginning of the 19th century was the time when the first collected editions of our Polish “classics” were released. F. K. Dmochowski publishes Krasicki’s (1803-4) and Karpiński’s (1806) works, Kiciński the poetry of Trembecki (1819), and not long after that, the editions prepared by F.S. Dmochowski of F.K. Dmochowski (1826), Kniaźnin (1828-9) and Zabłocki (1829-30). This is the context in which we must consider the Wilno editions: Trembecki’s 1822 Poezje, but also Krasicki’s Dzieła in the edition printed by the Typographical Society (which arose in the university milieu, in circles close to Borowski), published in 1819, and thus barely a year after the publication of “Uwagi nad Monachomachią.” Curiously, though there were voices that urged the Society to publish works by authors of the “golden age” or historical works, it was in fact authors of recent vintage – Krasicki, Karpiński and Kniaźnin – who dominated the short list of authors it published. It is thus not surprising that the first attempts to prepare a philological edition, made by Borowski and Mickiewicz, relate to those very poets, all the more since classicist poetry based on “extensive and profound erudition” seemed to demand such a commentary. Nevertheless, we must note that the decision to provide works written only a few decades earlier with an apparatus, previously accorded only to texts from antiquity, and thereby acknowledging them as objects of scholarly study, bears the mark of undeniable innovation. At the same time it should be noted that Mickiewicz’s Commentaries follow a track previously cleared for him by Borowski, though with certain modifications. The work’s preface begins with remarks on the subject of the genre of descriptive poetry, followed by a description of Trembecki’s talent (this is probably where we find the most innovative tones, in the discussion of his style’s influence on the “nature of our native tongue”) and the structure, i.e., a summary, of the poem. The commentaries themselves, to a greater extent than is true of the “Uwagi do Monachomachii,” relate to the language of the work. In Mickiewicz’s work, as in Borowski’s, we likewise find explanations of factual matters, while the “comparative” element is less prominent, limited to showing the references to Horace, Ovid, Virgil, Homer, and Lucretius – while there are no references to more contemporary descriptive poems. The choice of footnotes is thus clearly dictated by the belief, expressed in the preface, that the force of Trembecki’s poetry originated in drawing from the resources of the Polish language and classical erudition, while he resisted the influences of French poetry that were common in his time. We thus see that Mickiewicz’s work harmoniously joins an inherited, conscientiously implemented model of utterance with the poet’s own convictions. Among the ranks of aids to expanding knowledge and perfecting taste and the profound knowledge of languages, theoreticians of the fine arts have justly placed the philological dissection [rozbieranie] of model writers; because in such consideration our mind finds its way, where the writer’s thought went, and through him learns to think, gathering with him ways of expressing our own thoughts; drawing from the spring whence genius drew its own powers, [our mind] can discover increasingly precious treasures for its own enrichment. Undoubtedly the dissection [rozbiór] of the Greek and Roman authors brings the most certain benefits in this profession and one can never work on them enough in that sense; nevertheless, we should not deny such an honor either to those who, being formed on those antique models, became writers, and from consideration of them, according to the work’s inner value, equally abundant fruits can be gathered. Despite the superstition of our age, resulting from too exaggerated opinions of philology and commentaries of classical Authors, whose works are the only ones deemed to require such study, Voltaire’s commentaries on Corneille’s tragedies appeared and were pronounced at once to be superfluous, but time has showed how many of the remarks contained therein proved useful to our translator of Corneille’s works. While not all texts are equally accessible to every reader: because often writers are accustomed to take the measure of their readers’ disposition from themselves, and therefore we can easily perceive both the need and usefulness that might be served by an explication of all of Trembecki’s writings, especially for readers only now formed, and not overly rich in knowledge of predecessors. The lack of understanding of certain places can lead to distaste or cold admiration for the writings of our great poet, who according to experts on Polish literature, from the large number of rhymers who lent lustre to the second half of the last century, was the only one equal to the poets of ancient Rome, and breathed life into his song with the enchanting spirit of antiquity. Having ignored many others who essayed their hand at this object, we delighted in reading the analysis of Krasicki’s Monachomachia, as well as the explication of certain places in Trembecki by A. Mickiewicz, and the footnotes to de Lagarde’s translation of Zofijówka. All of these fragmentary collections of Trembecki’s poetry, inadequate in all respects, leave open the demand for a complete, or rather critical Edition of at leats all of his known works. These plans were obstructed by historical developments and Klimaszewski’s emigration; nevertheless, this first volume of Trembecki’s poetry became an important source of textual variants for later publishers. The little book published in Wilno on the eve of the Rising must therefore be acknowledged as a crowning achievement of classicist practices of literary scholarly analysis. Metaph. Rozbierać co u siebie rozważać, rozbaczać, roztrząsać; […]. Rozbierajcie tę rzecz, a dajcie tu poradę. [To take apart something, to consider, to ponder, to discuss. (…) Think this thing over and give us some advice here.] Budn. Judic 20, 7. Co noc to rozbierajcie dnia przeszłego sprawy, Tom przystojnie uczynił, tum bogu nieprawy. [Every night think over the affairs of the previous day, what you have done that was becoming, what was unlawful by God.] J. Kochan Ps. 4. Dziwnie mowę tę u siebie rozbierali [They thought to themselves singularly over that speech.] Biel. 433. Słowa te słusznie pamiętać, pókiśmy żywi, rozbierać i uważać mamy [It is right to remember those words while we live, we should consider and pay attention] Dambr. 220. Pomnij to, co rzekę, rozbierać więc z sobą. [Remember what I say, ponder it then to yourself.] Groch. W. 352. Thus in addition to “taking apart,” i.e., weighing or considering, certain problems, as people were said to do by means of the verb “rozbierać” in old Polish, people often pondered and took apart words as well and were described doing so with the same word. The Warsaw dictionary here gives an intriguing additional example from Jesuit priest Jakub Wujek’s 1593 translation of the Bible: “Rozbiera<j>cie pisma, bo się wam zda, że w nich jest żywot wieczny” ([You study/] Study the Scriptures, because you think that in them is eternal life). “Rozbieranie” may thus be understood to mean careful consideration and thought about words, including words in a text, possibly resulting in or benefiting from a detailed commentary. Thus, as we have been tracing the meanings of the word “rozbiór,” we have also traced the practices it was used to define in the early nineteenth century. This survey enables us to point to some of their shared features. All of these forms of analysis or dissection are connected by the flow of an argument proceeding in a manner following the order of a literary work; these are studies that refer to the text under discussion almost always (with the exception of certain passages in Osiński’s lectures, particularly those concerned with longer works) practically line by line (sometimes scene by scene, passage by passage). In the case of analyses presented as commentaries, they appear together with the text under analysis, where in the case of lectures or reviews they quote frequently and extensively. They address the “arrangement” or structure of the work in various forms, as well as the logic of the representations it contains, and evaluate that structure. The multiplicity of the meanings of the word “rozbiór” itself as a term for a certain genre of scholarly text is no doubt related to the lack of clear boundaries between the many forms of utterance functioning in the period in question. A review of a contemporary text, whether literary or scholarly, an analysis of a work presented in a university lecture, or a commentary for a print edition could each be called a “rozbiór.” In all of these, a similar method of reading was applied, as described above. Naturally individual instances of the method’s application differ considerably from each other. Osiński’s comparative analysis, with its goal of finding definite rules governing works of literature, the Rozbiory by Słowacki that scrutinize ancient classics, and the philological editions of Borowski, Mickiewicz and Klimaszewski all bring out the potential of the late eighteenth century approach to textual analysis, which combines the precision of anatomical dissection, mathematical analysis, or the chemical process of breakdown into parts with the spirit of contemplation of the Scriptures and the verve of a critical review; made richer by the achievements of classical philology, analyses of this type by the “Wilno School” created the model for today’s critical editions. The article presents selected practices of analysis of literary texts adopted in Polish literary scholarship in the first decades of the nineteenth century, particularly those connected with academic work. The variety and simultaneously common features among the various examples of classicist “close reading” are shown through a semantic analysis of the word “rozbiór” which was applied to such readings in the period. The pioneering adaptation of the methods of classical philology to work on a modern text, carried out by critics affiliated with the University of Wilno (now Vilnius), Borowski, Mickiewicz, and Klimaszewski, represents a particular object of interest. L. Osiński, Wykład literatury porównawczej, in Dzieła (Collected Works), vol. 2., Warszawa 1861, p. 7. L. Osiński, op. cit., p. 1. Emphasis mine – H.M.
 L .Osiński, op. cit., p. 87. Of course the category of comparison was often discussed, above all during debates on the theme of comparative studies’ identity as a scholarly discipline. In the historical context referred to here, and in the context of connections between comparative studies and philology, it is important to consider the works of T. Bilczewski: “‘Ancilla philologiae’, ‘ancilla nationis’? Komparatystyka a filologia narodowa” (“Ancilla philologiae,” “ancilla nationis”? Comparative Studies and National Philology), in Przyszłość polonistyki: koncepcje – rewizje – przemiany (The Future of Polish Studies: Concepts, Revisions, Changes), ed. A. Dziadek, K. Kłosiński, F. Mazurkiewicz, Wydawnictwo Uniwersytetu Śląskiego, Katowice 2013 or “Historia literatury, komparatystyka, przekład” (Literary History, Comparative Studies, Translation), Ruch Literacki 2012, vols. 4–5. L. Osiński, op. cit. p. 16. Though writers’ style is also a topic considered by Osińskiego and he sometimes comments on expressions which are, in his opinion, tasteless. Słownik języka polskiego, ed. A. Zdanowicz… op. cit. E. Słowacki, “Rozbiory pisarzów,” in Dzieła z pozostałych rękopismów ogłoszone (Works Omitted from Previous Manuscripts), vol. 3., Wilno 1826, pp. 1 –209. E. Czaplejewicz, “Euzebiusz Słowacki jako teoretyk literatury. Uwagi i spostrzeżenia” (Euzebiusz Słowacki as Literary Theoretician. Notes and Observations), Przegląd Humanistyczny no. 6/1980, p. 87. E. Słowacki, op cit., p. 72. Słownik języka polskiego, ed. A. Zdanowicz. Słownik języka polskiego, ed. J. Karłowicz. The Dziennik wileński was selected because it published some of Słowacki’s texts, as well as Borowski’s “rozbiory,” a topic addressed below. Given that it constituted, to a great extent, an area of expression for professors at the University of Wilno, reviews of scholarly works are doubtless overrepresented therein. The more common (in contemporary language at least) Polish word for a review, “recenzja,” also appears in the Dziennik, even as the title of a work. L. Borowski, “Rozbiór Samoluba,” in Uwagi nad poezją i wymową i inne pisma krytycznoliterackie (Remarks on Poetry and Speech and Other Literary Critical Writings), ed. S. Buśka-Wroński, Warszawa 1972, p. 155. L. Borowski, “Uwagi nad Monachomachią Krasickiego,” Dziennik Wileński 1818, vol. 2., pp. 284 –288, 471 –486. In the edition prepared by Buśka-Wroński the headings of works are omitted, and the text placed in the chapter of Commentaries, effacing the link between the “Uwagi” and “Rozbior Samoluba,” which is placed in the Reviews section. The contemporary edition also conveys no idea of the form of the text, which in the first edition appeared as footnotes to the first canto of Monachomachia, whereas in the selected works the notes are presented in the main body of text, between successive sections, disrupting the continuity of Krasicki’s text. I present these in the order in which they appear in the text. To highlight the erudition of Borowski’s commentary, it is important also to remember that the sources cited in the footnotes containing historical explanations are equally numerous. S. Buśka-Wroński here writes of Borowski’s “comparative method”: “the conception itself is drawn from the language of the criticism of that time, which formulated judgments evaluating a given literary work through comparison of the work with other works recognized as ‘exemplary’ for the same genre or style” (S. Buśka-Wroński, introduction to L. Borowski, Uwagi, op. cit., p. 15). This formulation, cohering nicely with Osiński’s lectures, nonetheless presents a narrow view of Borowski’s editorial method, which does not always compare, but sometimes points to references and tropes. A. Mickiewicz, “Objaśnienia do poematu opisowego Zofijówka” (Explication of the Descriptive Poem Zofiówka), in S. Trembecki, Poezje (Poetry), vol. 1., Wilno 1822, p. 382. This has previously been noted by Juliusz Kleiner: “he was the first to offer a scholarly analysis and an exemplary scholarly edition in the Uwagi nad ‘Monachomachią’” (J. Kleiner, Mickiewicz, vol. 1 Dzieje Gustawa (History of Gustaw), Lublin 1948, p. 39, quoted in Z. Rejman, “Romantyk o klasyku. Adama Mickiewicza Objaśnienia do poematu opisowego ‘Zofijówka’” (Romantic on Classical. Adam Mickiewicz’s “Commentary on the Descriptive Poem ‘Zofijówka,’” in Świadomość literacka polskiego oświecenia (The Literary Consciousness of the Polish Enlightenment), Warszawa 2005, p. 297. S. Buśka-Wroński, op. cit., p. 15. Sophocles, Trachiniae. Graece, in usum lectionum edidit et notis illustravit G.E. Groddeck, Wilno 1808. Of those mentioned in the Nowy Korbut literary bibliography, the only one I was unable to get a glimpse of was Persius’s Satires. A.P. Terentius, Adelphi czyli bracia. Komedia do użytku szkół przystosowana przez J. Henryka Augusta Schultze, rektora osterrodzkiego, przedrukowana z encyklopedii dla szkół klasycznych łacińskich pisarzy (Adelphi or the Brothers. Comedy for Use in Schools, Adapted by J. Henry August Schultze, Rector of Osterrode, Reprinted from the Encyclopedia for Schools of the Classic Latin Writers), Wilno 1813. P. Owidiusz Naso, Metamorphoseon to jest Przeobrażenia ksiąg piętnaście przekładania Jakuba Żebrowskiego (Metamorphoses or Transfiguration in 15 Books, Translated by Jakub Żebrowski), Wilno 1821. “O Jakubie Żebrowskim i jego przekładaniu” unfortunately has not been republished in any contemporary collection of Borowski’s writings. As well as Mickiewicz’s own fascination with Trembecki: “Authors of studies of Mickiewicz, of whom I have in mind Piotr Chmielowski, Roman Pilat, and also Józef Tretiak, Henryk Życzyński, Juliusz Kleiner, write about how the young Mickiewicz was fascinated by Trembecki and consciously made him his master” (Z. Rejman, op. cit., pp. 294 –295). For a short summary of Mickiewicz’s attitude toward Trembecki, see Dorota Siwicka, “Stanisław Trembecki,” entry in Mickiewicz. Encyklopedia, ed. J.M. Rymkiewicz, et al, Warszawa 2001. See Z. Skwarczyński, Poprzednicy filomatów (Precursors of the Philomaths), Pamiętnik Literacki, no. 1/1956, pp. 1-25 and D. Beauvois, Szkolnictwo polskie na ziemiach litewsko-ruskich 1803-1832 (Polish Education in Lithuanian and Ruthenian Territories 1803-1832), vol. 1., Uniwersytet Wileński (University of Wilno), Lublin 1991, pp. 195-196. The anonymous author of the article “Myśli obywatelskie o Towarzystwie Typograficznem Wileńskiem” (A Citizen’s Thoughts on the Wilno Typographical Society) writes: “It would be easy to find hardworking publishers of our old authors of the age of King Zygmunt, with damage to the Enlightenment and with disparagement of national glory, buried in reproach and ignorance” (Tygodnik Wileński [Wilno Weekly], no. 136, 15 April 1819, p. 235). Joachim Lelewel wrote: “Let us hope that when truly patriotic enterprises appear, in reprinted chronicles, beginning from Bielski, that we will be able to buy them for the price of a printed New Testament in Petersburg. We must wait for a Wilno Typographical Society that will have the benefit of the nation for its purpose: and in today’s state of affairs, that one society is capable of assuaging that great need” (“Pielgrzyma w Dobromilu czyli nauk wiejskich rozbior z uwagami nad stanem wiejskim w polszcze i ulepszeniem oświaty jego” [The Pilgrim in Dobromil, or an Analysis of Country Learning with Remarks on the State of the Countryside in Poland and Improvement of its Education], in Rozbiory dzieł obejmujących albo dzieje, albo rzeczy polskie różnymi czasy przez Joachima Lelewela ogłoszone w jedną księgę zebrane, [Analyses of Works Encompassing Either History of Polish Affairs of Various Times Made by Joachim Lelewel, Collected in One Book, Poznań 1844, p. 97). Earlier, the historian complains that “Our poetry printed in books […] apparently does not bring enough of the fruits desired instantaneously for country folk.” In this connection he mentions Kniaznin, Karpiński and Krasicki (p. 92). I was unable to find a full list of the titles published by the Society, but they probably consisted of: Dzieła poetyckie Ignacego Krasickiego (Poetic Works of Ignacy Krasicki, 1819), Dzieła prozą Ignacego Krasickiego (Prose Works of Ignacy Krasicki, 1819; together with the previous title, 10 volumes of poetry and prose in all), Pieśni nabożne (Godly Songs) by Franciszek Karpiński (1819), Statut Wielkiego Księstwa Litewskiego (Charter of the Grand Duchy of Lithuania, 1819), Bajki i przypowieści by Ignacy Krasicki (Fables and Proverbs, 1820), Poezje by Franciszek Dionizy Kniaźnin (Poetry, 1820, 3 volumes), Pan Jan ze Swisłoczy by Jan Chodźka (Pan Jan from Swisłocz, 1821). A. Mickiewicz, op. cit., p 380. Mickiewicz’s “Objaśnienia” can of course be found in the anniversary edition of Mickiewicz’s Complete Works (Warszawa, vol. 5. 1999), but I here have made use of the original because I was also interested in the manner of their placement in the book as a whole – they were appended at the end of the collection as a separate article. For a highly detailed analysis of Mickiewicz’s commentary, see Z. Rejman, op. cit., pp. 299 –312. 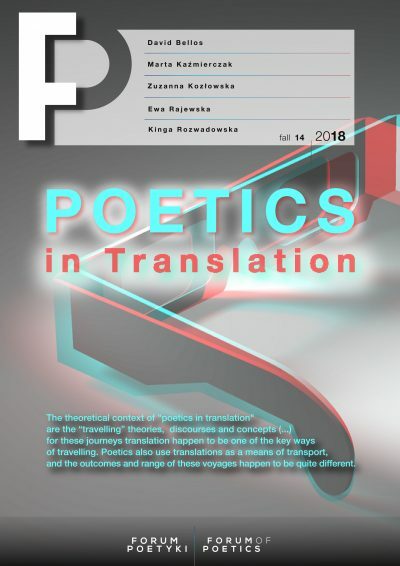 Rejman’s article focuses on the question of the descriptive and imagistic aspects of poetry in Mickiewicz’s footnotes in the context of his formulation of the relations between Romanticism and Classicism. Klimaszewski’s fate, particularly in exile, is described by E. Wichrowska in the book Hipolit Klimaszewski – nieznana karta z dziejów Wielkiej Emigracji (Hipolit Klimaszewski – An Obscure Page from the History of the Great Emigration), Warszawa 2012. That monograph is focused on an analysis of the surviving correspondence of Klimaszewski as a document of his life, which is why “Rozbiór poezji,” though it was even included in the title of one of his chapters, is dealt with in a single sentence (p. 60). Excerpts from the list of his subscribers are also included (p. 61), while there is no list of the works of Trembecki discussed in the work. The next part or parts were never released. The only surviving fragment that could be a part of the planned continuation of the work consists of an article published by Klimaszewski in his Noworocznik Litewski (Noworocznik Litewski na rok 1831 [The 1831 Lithuanian Annual], published by H. Klimaszewski, Wilno 1830), entitled “O charakterze Henryka Brühla i wpływie Fryderyka Michała Xięcia Czartoryskiego Kanclerza W. W. Xtwa Lit. na sprawę inwestytury kurlandzkiej. Rzecz wyjęta z rozbioru wiersza St. Trembeckiego na śmierć Xięcia Kanclerza” (On the Nature of Henryk Brühl and the Influence of Grand Duke Fryderyk Michał Czartoryski, Chancellor of Lithuania, on the Matter of the Courland Investiture. Matter Extracted from an Analysis of Trembeckis’s Poem on the Death of the Chancellor). Published earlier as a separate article in Dziennik Wileński, vol. 8. 1829, pp. 433-443. H. Klimaszewski, Rozbiór poezyj Stanisława Trembeckiego, Wilno 1830, pp. 5 –6. It should also be noted that where the translations are concerned, they are also commentaries on Trembecki’s translation as well as the (originals of the) ancient texts being translated. See S. Trembecki, Pisma wszystkie. Wydanie krytyczne (Complete Works. Critical Edition), vol. 1-2, ed. J. Kott, Warszawa 1953; E. Rabowicz, Stanisław Trembecki w świetle nowych źródeł (Stanisław Trembecki in the Light of New Sources), Wrocław 1965; S. Trembecki, Sofijówka, published by J. Snopek, Warszawa 2000. See E. Wichrowska, op. cit., p. 56. Słownik języka polskiego, ed. J. Karłowicz, op. cit., entry for “rozebrać.” This quotation comes from the Gospel of St. John (5:39) and is rendered thus in the King James version: “Search the scriptures; for in them ye think ye have eternal life: and they are they which testify of me.” More recent (and apparently more accurate) translations use “study carefully” or “study diligently” instead of “search” – the passage relates to the Jewish tradition of interpretation and commentary.